I'm looking for some recommendations on replacing my current binoviewing set. I've been using 24mm ES 68s in my Earthwin Binoviewers, somewhat successfully, but not successfully enough that I am set on them. The view is great, but the comfort factor is killing me. I also hate the tapered barrel which creates problems in getting them set right and they are too fat for my ID of 66mm which causes me to have to press my entire face into them and pinches the bridge of my nose when viewing. Initially I'd like to find a direct replacement pair for them in the widefield range (18-24mm) then something primarily for planetary viewing later on after I've settled on the wide set, ideally of the same brand/series. The Powerslide gives me 1.2x, 1.9x, and 2.4x. The primary scope is a 14" f/4.6 Dob, but also occasionally an ED127. I prefer to have comfortable eye relief 15-20mm and a good wide AFOV >65. I like having the periphery context and am not interested in 50 degree AFOVs. TV Panoptic 24mm - They appear to solve my tapered barrel problem with ES, and seem to have more space at the top for my nose. I used to have a 27mm Pan I used in mono mode and I didn't really like it much though. Pentax XW 20mm - I am concerned of these having the same issue as the ES with being too fat, the barrel looks quite large but seems to taper more so I don't know. Anyone with a similar ID tried these? TV Delos 17.3mm - I owned this a while ago and only used in mono mode, but I really loved it so it's pretty high up there, but seems like a fairly big hit in AFOV due to the shorter FL compared to my current 24mm ES. Baader Morpheus 17.5mm - Just here as a competitor to Delos 17.3 - having tried the Delos I probably wouldn't pick this over those unless someone has some really great reason. Baader Hypersion 24mm - I had Hyperion 8-24 zooms previously and liked them, except the super narrow FOV at the upper end of it. Price is right but once I again I just can't tell how the comfort would be, they appear quite bulky. Vixen LVW 22mm - I've never used Vixen or know much about them and they appear hard to find, but the specs are nice and the form factor looks good. Any thoughts or recommendations, among these or others I should be considering? Edited by jtrezzo, 19 March 2019 - 06:09 PM. what binoviewers do you have? I have 24mm 68 AFOV Panoptics and Denk II with powerswitches. Since you already have ES 24mm you don't need to duplicate. Maybe 16-18mm 82 AFOV? I have 14mm 82AFOV ES pairs which I rarely use due to too much power. Look into LOA 21mm 3D which are very fun with binoviewers for a unique and different 3D experience!!!! If you are looking for new binoviewers, I would recommend Denk Binotron or Earthwing both with powerswitches to make it easy to switch power and save on eyepiece pairs. Edited by Mike W, 19 March 2019 - 10:32 PM. 23.26mm Carl Zeiss Jena 65° eyepiece. Very comfy, staggeringly sharp... and specifically designed for binoviewing. (and remember, since your are not in the EU, subtract 19% from the listed price). My binoviewers are the Earthwins. They look much ike the Denk II with powerswitches basically. In fact the guy running the company is Bill Dankmeyer, not sure how all that came about but they are nice. Well as for duplication, I plan to replace the ES 24mm due to the issues I have with them. They are just really difficult to look through...if only I had slightly wider pupil distance! Or the body was smaller. I think I have heard of those LOA - are they worth it? Very interesting the Zeiss one. Man is that ugly but I imagine very sharp! Edited by jtrezzo, 20 March 2019 - 12:14 AM. Ugly, you say? No, I will not hear of it! Actually, I was waiting for that comment, and I do agree with you. B) they don't look too bad next to a whole lot of other eyepieces out there. And you have the option of altering the aesthetic (for better or for worse) by using the eye guard. It certainly looks more appealing there, and an eyeguard actually was one of my concerns. It looked as if there was none at all. How is the comfort viewing through that? What are the dials on the side? An internal focus? Also, is that 21mm figure on there the eye relief? I'm not sure what AP means in German. I am tempted to go for these. Edited by jtrezzo, 20 March 2019 - 10:01 AM. I find my 19Pan feels extremey comfortable to my eyes and is a great eyepiece on it's own. Very small and compact for a BV. Want smooth straight stems? Takahashi LE range or 28mm Erfle. APM 24mm UFF. I have Earthwins too-- love 'em. I'm surprised no one mentioned Denkmeier D21. They are designed specifically for comfort with binoviewers, and have been reviewed favorably compared to Pans (https://www.cloudyni...-21-comparison/). I personally use, and enjoy Meade 24mm SWA, but would get the D21 before going for Pans. I suggest that you not rush into buying these. What I did suggest was that you add them to your shortlist, my thinking being that if you were indeed willing to consider them, I would happily tell you more about them. Yes, the eye relief is 21mm. I do not know if this is sufficient to permit viewing with glasses. It seems reasonable to suppose that the eye relief is measured from the centre of the eye lens, rather than the top of the housing. 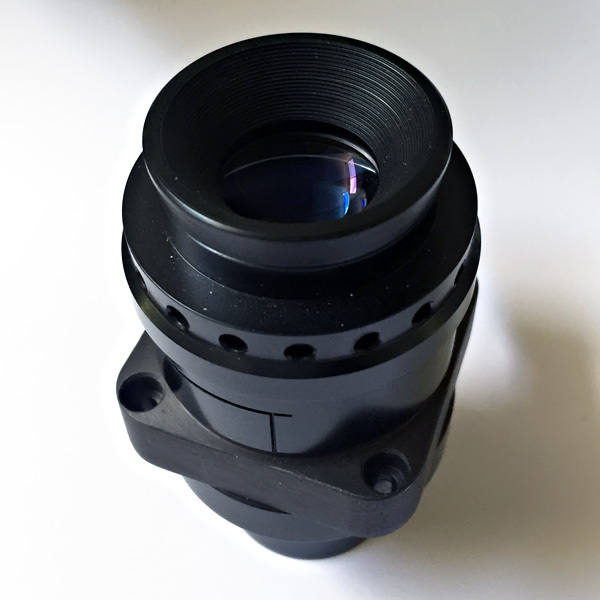 Given that the eye lens is deeply concave, the usable eye relief would be quite a bit less than 21mm. If you are interested, I could measure the usable eye relief. Without glasses, there is plenty of eye relief. The eye guard is an unusual design (e.g. it is ventilated). I do not like it because it is made of metal. 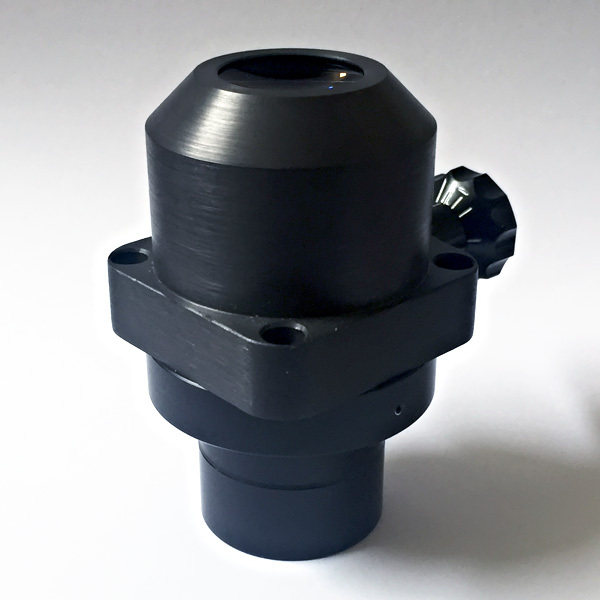 The top part of the eye guard assembly can be unscrewed, however, and replaced with a push-fit rubber eye guard of stereo microscope type, easily found in eBay. This works well. As with just about all eyepieces, it feels more immersive without an eye guard. Yes, that protrusion is part of a focussing mechanism. You can dial in a perfectly sharp field stop and you can use it set a different focus for one eye. The eyepiece is crazy sharp. Stars are utterly beautiful points. I have over 90 eyepieces, and I can’t think of one that is sharper. I have some excellent wide field eyepieces, e.g. Pentax XW, Zeiss Diascope, that, on-axis, show a very tiny hint of false colour on the Moon’s limb. Not this eyepiece — the Moon’s limb is utterly perfect. The presentation is very “natural,” with little sense that one is looking through an eyepiece. It is very easy to take in the view, and there is no kidney beaning. This is one of the best aspects of this eyepiece. I have two of these eyepieces, but I have given up on binoviewing (for eyesight related reasons). In solo use, I often use a 2x or 2.5x Powermate or a 1.5x Seibert telecentric. The eyepieces works beautifully with these. On-axis sharpness is incredible, and it’s very good off-axis — for example, with the 2x Powermate, the Trapezium E and F stars are visible even at the field stop (in my TEC 140 APO). Note that I do not have a focal extender that gives enough magnification for use of this eyepiece on planets. I am therefore unable to comment on its performance in that regard. There is a negative aspect to this eyepiece about which you must be aware: There is a noticeable colour cast (on the warm side). I have no problem at all with this on the Moon (in fact, I like it), but I don’t like it on deep sky. Different people will have different opinions on such matters. And the eye does adjust. But it is not just an issue of aesthetics — the way I see it, any colour cast at all implies that transmission will not be optimal. I was observing Omega Centauri from a dark site. It looked gorgeous in this eyepiece. Yeah, the eyepiece imparted a colour cast to it. It wasn’t objectionable. But, upon swapping in a 30mm Leitz, the crystal clarity of that eyepiece blew me away. All of a sudden the 23.26mm CZJ was just not acceptable. Omega Centauri also looks gorgeous in the 12.5mm Docter (that’s a high contrast eyepiece if I ever saw one). The CZJ plus 2x Powermate provides a different view. Whereas in the Docter stars are tiny and perfectly formed, in the CZJ they are indescribably beautiful points. Yes, the CZJ is sharper. But the Docter pulls in faint stars more easily. And it does not impart a colour. Which is the most impressive view? Hard to say. That’s why I keep (and use) both eyepieces. Thanks so much for taking the time to write that review of them. I love the idea of the sharp pinpoint stars and if you say it's the sharpest out of over 90 eyepieces, well that is certainly saying something impressive! I guess I'd have to see it to know if the warm cast would be an issue. The cost seems no worse than the Pan 24, less actually. Have you directly compared those two? Perhaps I may pick those CZJ up and try to find a couple used 24 Pans to compare them. Unfortunately it seems to be the case with pretty much anything like this the only way to pick one you really like is to actually try them out. Thanks all for the suggestions and thoughts. Alas, no, I have not compared the Zeiss with the Tele Vue Panoptic. I would love to do so. By the way, the Zeiss has a field stop that is about as wide as can reasonably fit into a 1.25” barrel. So it should show roughly the same true field of view as the Panoptic. The latter has a slightly wider apparent field perhaps by virtue of more rectilinear distortion. I do agree with you — the only way to know if you’ll like an eyepiece is to try it. Personal taste being what it is, eyepiece buying suggestions are about as worthless as music recommendations. I’ll happily describe an eyepiece, perhaps enthusiastically, but I don’t feel comfortable suggesting to people that they buy it. The barrel of the Zeiss has that stupid undercut. It’s not worse than on other eyepieces that have this defect, but I do wish it wasn’t there. The Zeiss is not barlow friendly, meaning that barlows introduce vignetting. (If I am not mistaken, this is also an issue with the 24mm Panoptic, right?) In addition, a barlow moves the exit pupil position further out, from which position it is not possible to see out to the field stop. This barlow nonsense is the reason I stick to telecentric devices. 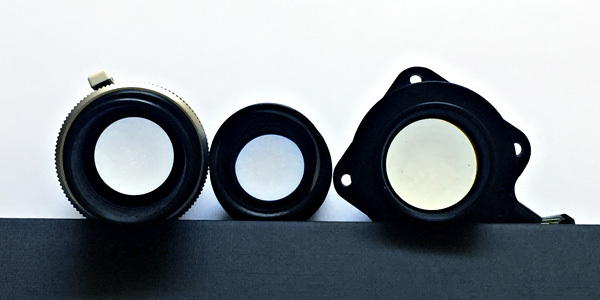 Finally, I include a photo of a “white sheet fo paper test.” It shows, from left to right, a 25mm Zeiss OPMI eyepiece, a 25mm Zeiss SP-L, and the 23.26mm CZJ. The colour cast in the CZJ is very obvious.